Saturday, April 27th, 9:00 a.m. – 4:30 p.m. 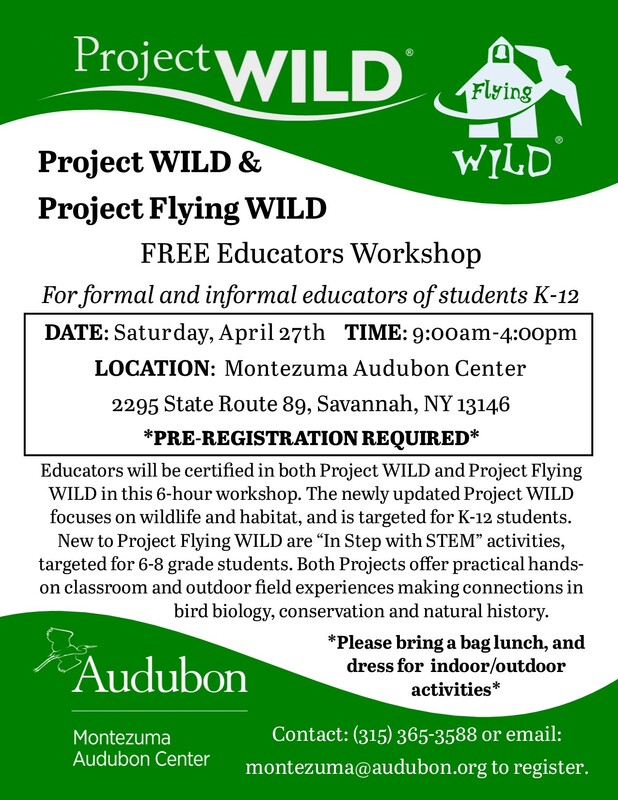 Educators will be certified in both Project WILD and Project Flying WILD. The Project WILD K-12 Curriculum and Activity Guide focuses on wildlife and habitat. The newly updated Project WILD is organized into topic units and is based on conceptual framework. New to Project WILD are “In Step with STEM” Activity extensions and Field Investigation Activities. Targeted for the middle-school audience, though widely adaptable, Flying WILD offers practical hands-on classroom and outdoor field investigation experiences connecting real-world experiences in bird biology, conservation and natural history. Please pack a lunch. Fee: Free.